Now The Details: Canadian Election Results: Who's Tory Now? Canadian Election Results: Who's Tory Now? 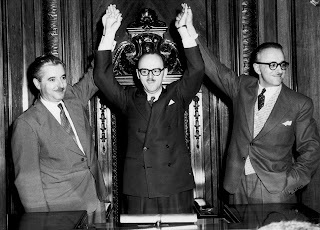 As the CBC's city hall reporter in Montreal in the 1970s, we media types were absolutely convinced that Mayor Jean Drapeau who we considered a reactionary ward heeler, would finally be defeated by a ragtag group (yes, a coalition) of unionists, Quebec separatists, ex-journalists and anglophone progressives known as the Montreal Citizens Movement (MCM). 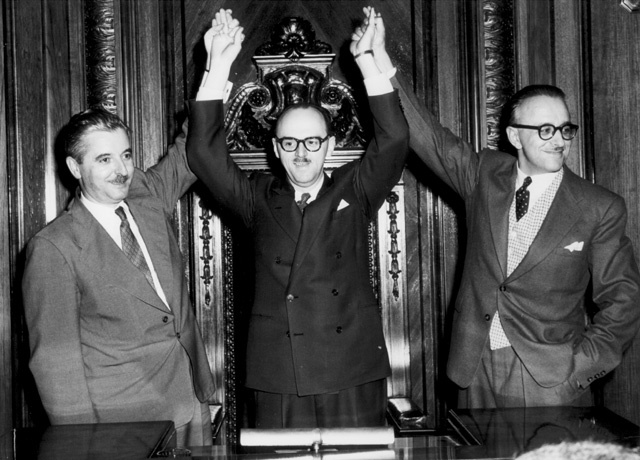 Drapeau, who served as mayor for an astonishing 29 years, would not be denied. 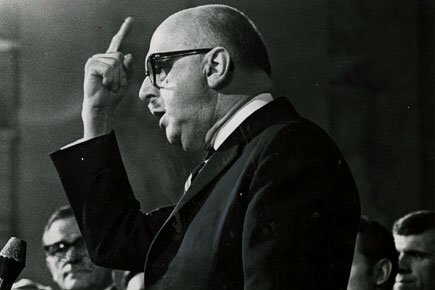 Even though not one Montreal newspaper had endorsed him, the 1978 election saw him roar back to power with the MCM winning only two out of 52 wards. On election night the press was corralled behind a rope in the foyer of the baroque city hall. Drapeau stepped up to a riser and glowering at us hacks he intoned, "Vox Populi,Vox Dei" (the voice of the people is the voice of God). We were being classically chastised for our hubris and wishful thinking. In 2011, the same admonition can be applied by Stephen Harper's Conservative Party to the pollsters and to the journalists who love them. The polls all said that it looks like a Conservative minority government. - Wrong. It's a majority. The polls said the Liberals would be reduced. - Wrong. They have been relegated to third place. The polls said the Bloc Quebecois would be reduced to a smaller presence. - Wrong. The BQ is down to two seats and has lost its status as a party in the next Parliament. The polls said that the NDP would do somewhat better than before. - Correct. They are now the official opposition with more than 100 seats. So how did the media get caught? In fairness to the pollsters, they were only indicating voter intention, not seats won or lost. But the media drew the conclusion that Canadians would not - COULD NOT - give Harper his majority. He might come close but still have a hung Parliament. Pollsters and the media need to do some soul-searching about why they weren't more cautious. "We need to go back and do some work to find out what went wrong, but nobody has the resources to do this," pollster Frank Graves of Ekos Research told the Toronto Globe and Mail. Say what? If pollsters don't have the money to do this properly, why are we listening to them at all? Media organizations have also been whittled down to a shadow of their former selves. They need to reassess their approach to coverage. My sense was that while they followed the leaders, few media organizations did much systematic reporting at the local level. They needed to get off the bus. But pack journalism ruled this campaign. Claims by the leaders were rarely tested. Bellwether ridings (as Canadian electoral districts are called) were not regularly visited by reporters to check out voter intention. Nor did social media seem able to get past the shared assumptions. Tweets and facebook pages were in a similar echo chamber to mainstream media. Until news organizations get back to more shoe leather reporting, and wean themselves from their jones about polling, political reporting will remain stalled, easily manipulated and prey to self-delusions. Glad to read a critique of social media. If I hear one more story on CBCNN (or any of the other big media outlets) about social media\twitter\facebook I'm going to puke. The CBC actually employs social media producers - whatever that means - and has two journalists working the swath of Ontario between Windsor and Toronto. And they work in London, and cover Kingston, from a morning show produced in Toronto, by Torontonians. As much as I enjoy CBC Radio (not so much TV, especially the heinous CBCNN) and am generally a CBC supporter, I'm afraid this Conservative majority will mean trouble for the Ceeb. "...prey to self-delusions...." Thank you for that, Jeffery. Yup! As long as Canadian media view the Conservatives led by Harper as the enemy at the gate they will never allow themselves to achieve the clear eyed bias free view that they claim.